Rock and Roll Hall of Fame quartet U2 is undeniably one of the biggest bands on the planet, equally known for their sweeping sound as for their visionary passion and idealistic sense of purpose. With Bono's soulful, grandiose cry, the Edge's intricately textured guitar parts, and the steady propulsion of bassist Adam Clayton and drummer Larry Mullen, U2's sound is instantly recognizable and much-imitated. It all began in 1976 when Mullen pinned a 'musicians wanted' ad to the notice board at Dublin's Temple Mount School. The four teenagers, who initially called themselves Feedback, rehearsed in Larry's Dublin kitchen. Inspired by punk, Feedback became the Hype and then U2, and were soon building a local reputation based on the passion for their performances. With each album and concert since, the Irish quartet has endeavored to create music of lasting worth and substance. And 40 years into their groundbreaking career, U2 continues to dominate with record-setting tours such as the ZooTV (1992-93), PopMart (1997-98) and U2 360° (2009-11) taking the world by storm. The band also sent shockwaves throughout the music industry in 2014 with the surprise release of their first album in five years, Songs of Innocence, for free via iTunes. 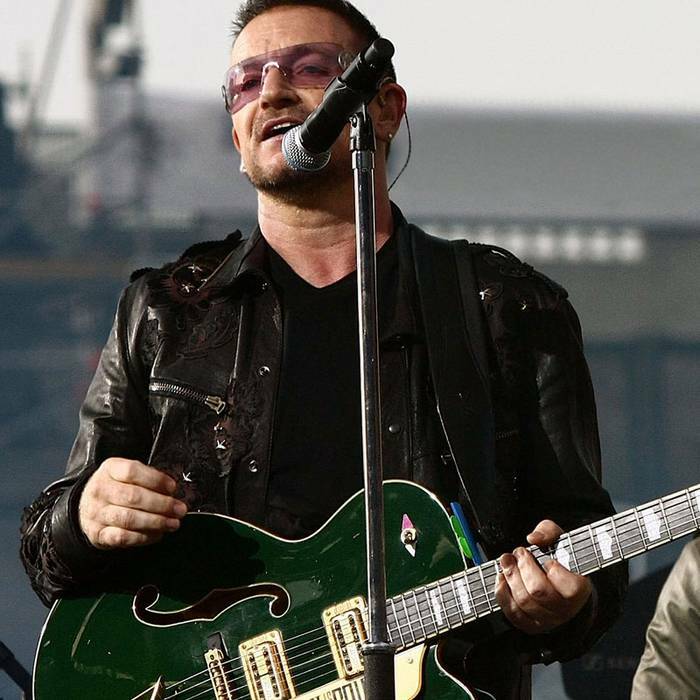 Bono’s high-profile work for social causes like third world debt relief, world hunger and AIDS and U2’s participation in such historic rock-for-charity events as Live Aid and Amnesty International’s Conspiracy of Hope tour have served as a beacon for positive change in the world of music. The Gretsch signature artist has been nominated for the Nobel Peace Prize, an Oscar and a Golden Globe. Bono was also named Knight Commander of the Most Excellent Order of the British Empire in 2007. Bono was born Paul David Hewson on May 10, 1960, in Dublin, Ireland. As a teen, Hewson and friends formed a fantasy world called Lypton Village for which they gave themselves nicknames. Hewson was christened Bono Vox (Latin for good voice), from the name of a local hearing aid shop.